Esther Hardi is strategist and innovation manager at Alliander, the largest regional and local grid operator for electricity, gas and heat in the Netherlands. She is the co-chair in Brussels of ETIPS NET – the European Technology and Innovation Platform “Smart Networks for Energy Transition” which aims to make sure Europe’s research and innovation (R&I) facilitates all energy customers and actors to rely on integrated networks, digital systems and new markets. For 20 years she has been working in the energy business in the field of competitive strategy, innovation and business development. She graduated as MSc in Applied Mathematics at the Technical University in Delft, studied Seismic and Acoustics at the Department of Technical Physics and started with the multinational Schlumberger offshore. After her international career she joined the energy trading company Nuon (Vattenfall) and later the grid operator Alliander and worked in the different business units as trading, retail, business and corporate. She has been a pioneer in biogas injection in the Dutch gas grid and is actively involved in renewable sustainable energy supply. System integration is a key driver in Power2gas, EBay for Energy, Heat systems 2.0 in neighbourhoods, pilot projects under her supervision. In addition to her work she is a PHD fellow at the University of Delft at TPM Economics of Infrastructures. 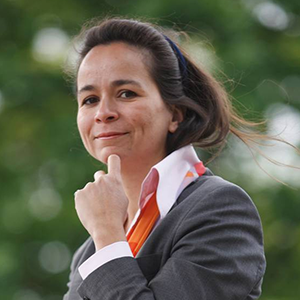 In the Netherlands she co-chairs the Program Board of the Next Generations of Infrastructures platform.